Kanapaha Botanical Gardens (Gainesville, Florida)is comprised of 24 major collections visually accessible from a 1 mile paved walkway. These include the state's largest public display of bamboos and the largest herb garden in the Southeast. Some of Kanapaha's gardens are organized taxonomically; others demonstrate principles of ecology or natural selection. Kanapaha Botanical Gardens is a premier Gainesville wedding venue with both indoor and outdoor rentals for wedding ceremonies, wedding receptions, meetings, retreats, conferences and other social functions. 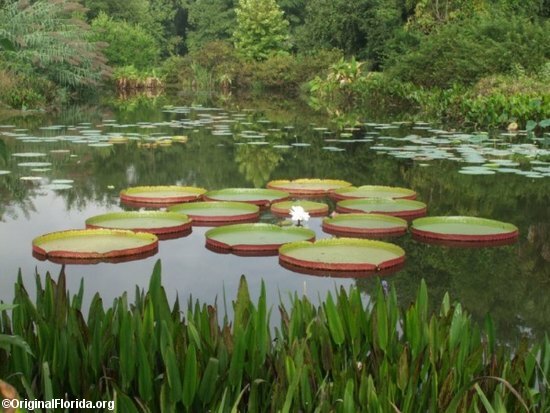 Kanapaha's signature plants include a premier stand of Chinese royal bamboo (Wong Chuk), and--during the warm months--giant Victoria water lilies and Asian snake arums. The months offering the most color are June through September.Kanapaha hosts many special events throughout the year including a Bamboo Sale andNorth Central Florida's premier horticultural event, the Spring Garden Festival. Another must-see is our Moonlight Walk when the paths and meadows are illuminated by special laser lights and more than 1500 luminaries; live music is featured as well. Except duringspecial events, like our Spring Garden Festival and Moonlight Walk, dogs are permitted on leashes. Picnic baskets are welcome and there is a picnic area very close to the entrance building.Kanapaha's walkways are largely wheelchair accessible and benches, gazebos and other rest stations are liberally spaced throughout the facility. An exceptional gift shop offers a varied and unusual array of items including original art and treasures from the natural world.